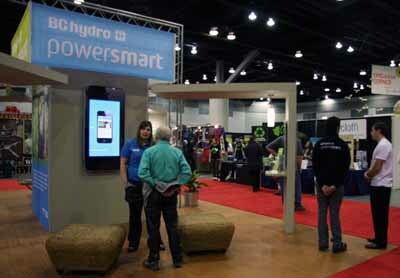 Once again, BC Hydro was a sponsor of EPIC The Sustainable Living Expo, May 13 to 15; to kick off the three-day event, Community Outreach hosted Power Hour on the main stage last Friday. 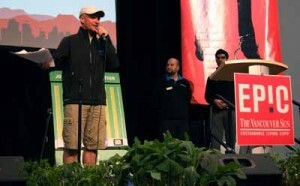 Team Power Smart Leader, Matt Hill of Run for One Planet, was the emcee at the Power Hour on May 13. He shared with the audience his Power Smart journey and some of the simple actions he does every day to encourage those around him to act with conservation in mind. Matt joked that people always know when he’s in the room. “I’m always unplugging everything that’s not in use – toasters, chargers, computers, everything really!” said Matt. Above: Team Power Smart Leader Matt Hill hosts Power Hour with Outreach representatives Jay Soper and Ashkhan Pishvaei. 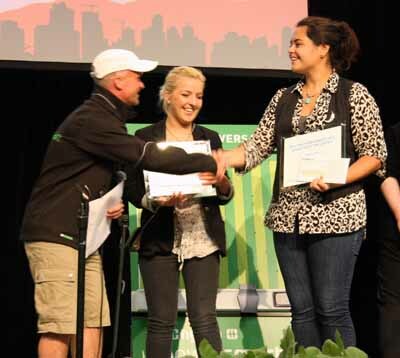 Matt congratulated Invent the Future contest winners, Andrea Diaz and Dominika Pilat of Vancouver, during Power Hour. The winners of the video category in the 16 to 19 age group had their video “Little Kids, Big Goals” aired on the main stage. The video focuses on raising awareness about energy conservation by following two young children who struggle to complete even the simplest everyday goals. The video reminds viewers how easy it can be to save electricity. Check out all the winning submissions at inventthefuture.ca. Above: Matt congratulated contest winners Andrea Diaz and Dominika Pilat. 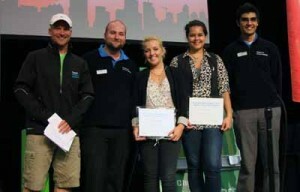 Above (left to right): Matt, Jay, Andrea Diaz, Dominika Pilat and Ashkhan. As a finale to the Power Hour, Outreach welcomed volunteers up to the stage to test out their new conservation themed activities: a plinko and hand crank game. 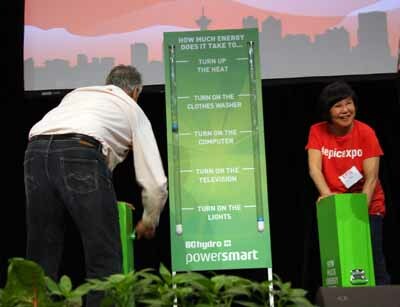 The volunteers were quizzed on Power Smart behaviours before facing off in the hand crank challenge. Above: Barry Fergusson, Community Investment, Outreach & Educations, competes against audience member Tina with the hand crank game. 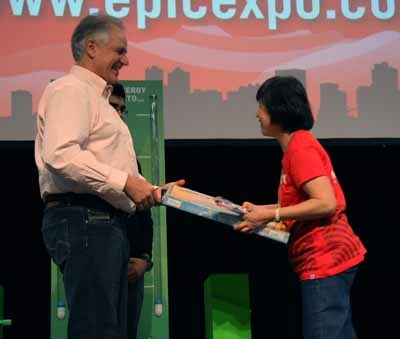 Above: Barry awards Tina with a Team Power Smart Earthopoly game for being such a good sport. Above: Community Outreach representatives Meaghan Fahey and Askkhan Pishvaei share conservation tips with customers at the BC Hydro booth.